Geelong star Ben Graham has quit the AFL to pursue a punting career in the NFL with the New York Jets. The Cats had hoped to retain the tall forward for another year or two, especially with the chance of ultimate football success in the near future. The young side is on the rise, only falling out of the premiership race this season with a preliminary final loss to Brisbane. It was widely known that Graham would eventually make an attempt at American football, with the 196cm (6' 5") super-boot an obvious candidate for a punting spot. Almost 31, Graham had spent the past two weeks trialling with several clubs, before today signing a "future free agent" contract with New York. He will do a pre-season then hope to make the main roster in August 2005, where an annual salary of over one million dollars (Australian) could be on offer. Graham, captain of Geelong from 2000 to 2002, will be hoping to emulate the deeds of former Melbourne and West Coast player Darren Bennett, who starred in the NFL for San Diego, and was named in the Team of the 1990s (his career appears to be winding down now, with Minnesota). 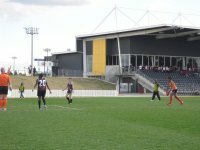 Other Australians have made the NFL, as far back as the 1960s, with the most recent attempts made by former AFL player Nathan Chapman, who has so far been unsuccessful in getting a regular spot. The loss of Graham will hurt Geelong's plans to stretch the opposition in defence with the arrival from Richmond of Brad Ottens, but the tall South Australian will at least help balance the loss of the former Geelong best and fairest winner.